Style: 3/4 Sleeve "Minnie" Tutu Dress. Fabric: Upper Body - 60% Cotton 40% Polyester - Faux Fur/Skirt - 100% Polyester. Color: Red, White, Black, Beige & Silver. I don't have a set. Size: M (7/8). We will be fair. BRING YOUR FAVORITE SNOW QUEEN FROM THE FROZEN MOVIE TO LIFE AND LET YOUR KIDS ENJOY WITH ELSA DRESS UP OR ELSA PLUSH. we have a few more of Disney frozen collection which are limited, grab it before it is gone. Elena Avalor. Graphic-Print Tutu Dress. Girls Size 3T. Disney's Princess. RED VELVET LONG SLEEVE UPPER WITH MINNIE MOUSE LOGO. BLACK AND GREY POLKA DOT TULLE OVER LINING. SKIRT - 100% POLYESTER. TOP -88% POLYESTER 12% SPANDEX. Longest length from top of shoulder: 25 1/2". Main Color: Red/White/Silver. Chest armpit to armpit: 12 1/2". A dress fit for a disney princess! Sheer short sleeves and top of bodice! Sparkly red waistband that goes all the way around the dress! 2 ruffled layers on the bottom of the dress, you can see a Belle and Beast silhouette in the bell printed on the top sheer portion of the dress, and the fabric has characters printed on it with beautiful roses! 60% Cotton 40% Polyester. Longest length from top of shoulder: 27 1/2". Main Color: Red/White/Silver. Chest armpit to armpit: 13 1/2". Sleeveless with a High Low Rounded Maxi Hemline. Colorful Chiffon Lined Dress. Polyester. Features your favorite princesses Top Disney Quality. Pink dress size 5/6 accented with rosettes on sleeves. I will do my best to answer them to the best of my ability. Inspired by Snow White and the Seven Dwarfs. 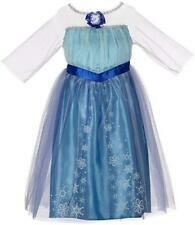 Snow White Party Dress for Girls. Embroidered Snow White with bird and floral details. Pink lining. Fabric - 100% outer and 100% polyester lining. underarm to underarm - 15". length (back, neck to hem) - 24" not including tulle. SPARKLE OVERLAY SKIRT AND ELSA SNOWFLAKE APPLIQUE DETAILING ON SATIN BODICE. Botton: Two layers organza tier ruffles. Lining with print design of Disney princess symbols: Apple for Snow White, Crown for Aurora, Guitar for Rapunzel, Sea Shell for Ariel, Glass Slipper for Cinderella. Ariel Dress for Girls. Ariel screen art. One-piece, sleeveless dress. Body and skirt lining: 95% polyester / 5% elastane. Kids Girls Polka Dot Sleeveless Black Dress with Minnie Mouse . Condition is New with tags. Shipped with USPS First Class Package (2 to 3 business days). Doc McStuffins Corduroy Dress. 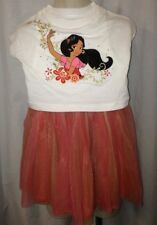 Size 7/8 includes t-shirt undershirt and corduroy jumper dress. D-Signed Disney Descendants 2. Black Choker Neck Handkerchief Hem Dress. The top part of the dress had a choker. neckline with little silver studs on it. sweater in colder weather. Girl Size 7-8. D-Signed Disney Descendants 2. Black Choker Neck Handkerchief Hem Dress. The top part of the dress had a choker. neckline with little silver studs on it. sweater in colder weather. Girl Size 6. Cotton Blue with Floral print Dress, lined with add on tie pocket. From Disney collection for Target. Perfect for the spring & summer! Size - Large 10/12 years. Condition - Good Used Condition (1 flaw - there was a tear on the white trim at the back part, it was fixed, completely unnoticeable when on, please see photo). Thanks for looking! Please, check out my other auctions. 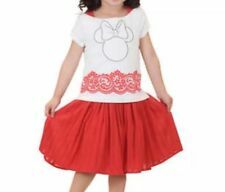 Adorable Minnie Mouse Red White Polka Dot Party Dress. Matching hair-bow. Zipper back closure and attached black satin belt. Tea length 32” Long. Waist 23”. I HAVE TWO OF THESE CUTE DRESSES IF NOT SOLD ALREADY. ONE IS SIZE XLARGE IN GIRLS SIZES 14-16. AND TH EOTHER IS SIZE 10-12. WITH SOLID RED POLYESTER UNDERNEATH IT.TOP SAYS MINNIE MOUSE WITH 2 SILVER FAKE TYPE BUTTONS AND FAKE COLLAR LIKED AND TWO CUTE LITTLE SHORT SLEEVES IN RED WITH THE SILVER POLKA DOTS. 3 layers skirt for puffiness. top layer is tulle red polka dot. length~13"- top 18" skirt. slip on one piece dress -.